Soi.38, named after Bangkok’s famous street food market, opened on Pulteney Street, Adelaide in October 2014 by Chef Terry Intrarakhamhaeng. 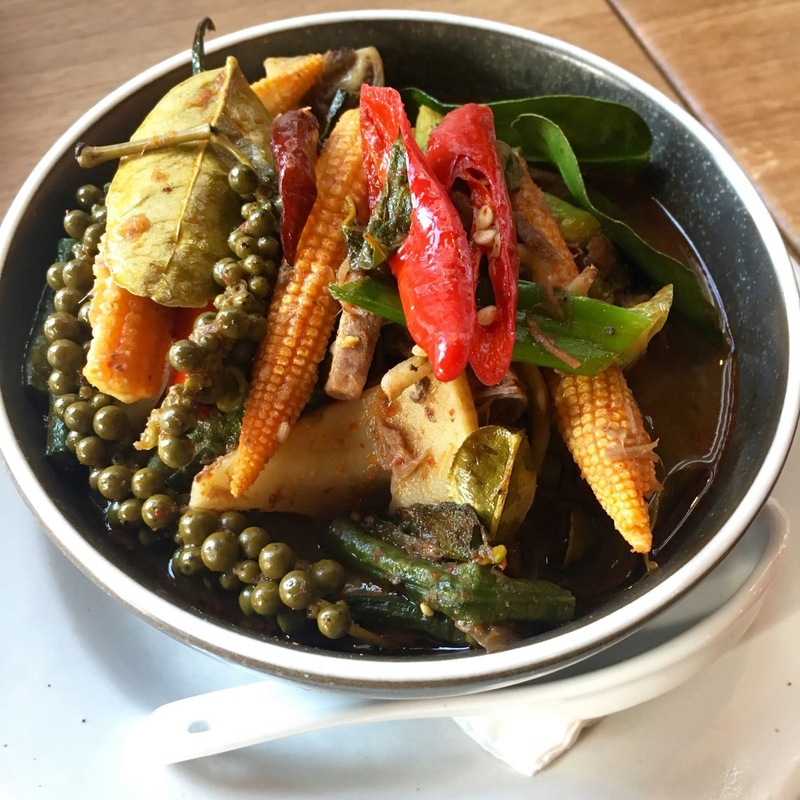 After many successful years including winning 'Best Southeast Asian restaurant in Adelaide' by the Advertiser Good Food Guide in 2017, Soi.38 is still serving their lucky customers some of the best regional Thai food you can find. On The Chopping Board (OTCB) was treated to a tasting of the new menu, which included dishes from Thailand's 6 regions, using the best local and ethically sourced ingredients. All food and beverages were provided on behalf of Soi.38. A peek of our Thai feast! I (Amanda) arrived to Soi.38 for a mid-week dinner and noticed the lovely redecorated interior. Gone is the dominate yellow and black and hello to the natural tones and an instant calming and comfortable feel. The menu is divided into small plates, salads, wok, curry, bigger plates, sides and rice, caters for coeliacs and vegetarians and even offers those who "don't like it hot" to inform the staff should you require less chilli in the dishes. Such generous service! To start our Thai feast, we were presented with 3 small dishes from the North of Thailand. The papaya salad, charred sausage and charcoal chicken. The Papaya Som Tum was colourful, textural and exuded that perfect balance of sour, sweet, salty and hot chilli flavours. It was an overall refreshing salad albeit spicy accompaniment for the meaty dishes. The charred sausage with fresh greens and prick noom was another great start to the dinner. The tasty sausage was tender, had the great char flavour we were expecting and was even more delicious with the not too hot prick noom, a chunky chilli dip, which we piled onto our slices of the sausage. We loved the charcoal free-range chicken and chilli dipping sauce. The chicken was succulent, flavourful and with the heat of the chilli sauce brought the extra zing to the dish that will make you want to do away with the fork and get right into the delectable chicken with your bare hands! The lobster spring rolls are not something you see often on a menu, so we felt most indulgent and excited to give these a try. Lovely and crispy, there was a good balance of lobster to pastry but I was hoping for a Thai herb or a delicate shredding of vegetable to accentuate the delicate lobster meat. Dipping the lobster spring roll into the Sriracha mayo helped to provide more flavour but it fell just short compared to all the other flavour packed dishes of the night for us. The Jungle Wild Goat Curry with ginger and mushroom was one of my favourite dishes of the night. Not one to go out of my way to order goat shows how well Soi.38 has crafted this dish. I've found when eating goat at other venues, it can be gamey and overpowering, which is why I'm hesitant of the meat but the goat in this curry was anything but! Tender, soft and infused with all the curry flavours from the West of Thailand, this dish had varying textures and perfect to enjoy with some sticky rice. Do yourself a favour and try Soi.38's spectacular goat curry. The King Prawn Plaa with lemongrass and nahm jim talay was a salad from the central region of Thailand and looked so colourful and interesting on the plate. The big juicy prawns were cooked beautifully preserving the sweetness of the meat and enjoyed with the abundance of fresh Thai herbs, chilli, nuts and dressing brought the signature sweet, sour, salty and heat tastes to a perfect balance. The wok fried line caught squid with chilli jam was yet another flavour packed dish. It was also up there as a contender for favourite dish of the night thanks to the variety of herbs and melt in your mouth squid. No chewy squid here! Order this one with a side of rice to help mop up the delicious fragrant sauce, as leaving that behind would be criminal! The 8 hour kangaroo tail curry with mustard pickle is a dish inspired by the South of Thailand but with an Australian native food twist. I've had two horrific kangaroo tail experiences in the past and was nervous for my third! Cautiously consuming the forkful of kangaroo tail, I was thankful this was far from horrific and was able to relax and enjoy the curry. It is a rich meat and combined with the rich depth of the curry sauce, it definitely won't be suited to all palates but I was happy Soi.38 was able to redeem the reputation of the tail for me! Finally from the west of Thailand the aubergine (eggplant) with minced pork, chilli and basil was another highlight dish for me. The juicy and tasty pork mince combined with the almost creaminess of the eggplant, freshness of the basil and heat of the chilli, and yes this one was on the higher end of the chilli heat scale, was completely moreish for me. As full as I was by the end of this incredible Thai feast I could not leave a bite behind! If you haven't been to Soi.38 before, or even if you have, it's time for a revisit. The renovations, new menu (which regularly changes due to seasonality and availability of ingredients), talented chef, wonderful service and convenient CBD location, all contributes to the success and reason why Soi.38 has been on the Adelaide scene for so long. And if deciding what to order seems like too much hard work, then leave it up to Soi.38 and choose the $55 feed me option. Sit back, relax and get ready for a flavour explosion!